All NORTH OAKS homes currently listed for sale in Delray Beach as of 04/21/2019 are shown below. You can change the search criteria at any time by pressing the 'Change Search' button below. "MOTIVATED SELLER! QUICK CLOSE!!!! 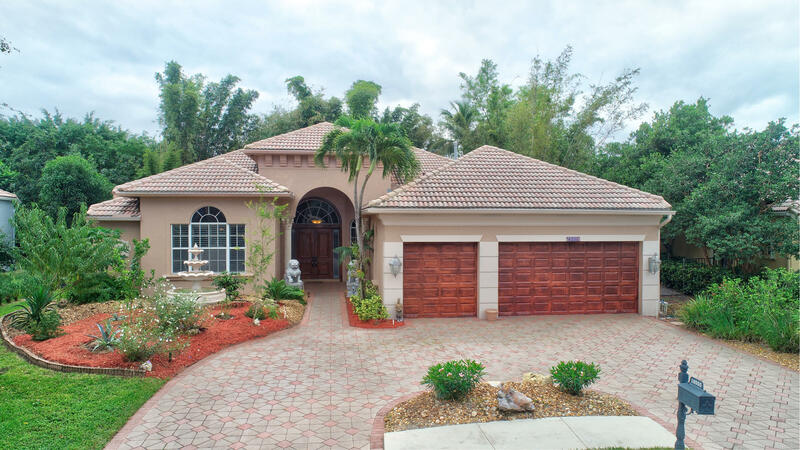 Located on a lovely cul-de-sa steps to houses of worship, this beautifully upgraded Single Story Home with Saturnia marble tile flooring on the diagonal, large master suite, his and her closets and lovely plantation shutters throughout. This amazing open Kitchen boasts beautiful quartz countertops, pull out drawers in kitchen cabinets, Bosch microwave & lovely steam stove, Samsung refrigerator and washer/dryer and 102 degree hot tub, The A/C and Hot Water Heater are 2 years old. Office can easily be converted to 4th bedroom. A yearly serviced Generator also is included with the property. Don't miss the $200,000 plus in upgrades!! Lions in front yard excluded, fan in kitchen and sconces in hallway excluded please"